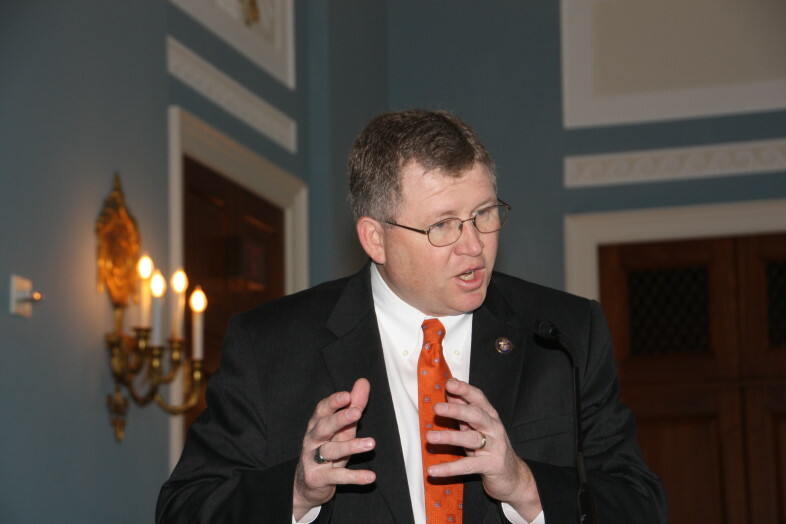 The Chairman of the House Ag Committee, Frank Lucas, is spending this week making multiple stops in his vast Third Congressional District as he holds Town Hall Meetings. The first of those meetings this week was held Tuesday morning in Clinton, Oklahoma, and Chairman Lucas spent a few minutes before the start of the Meeting with Farm Director Ron Hays as they talked about the budget reductions that will be decided upon this fall by the Super Committee- and how they relate back to the 2012 farm bill. Congressman Lucas told the Radio Oklahoma Network that he was spending a good bit of his August communicating with Collin Peterson, the ranking minority member of the Committee, in an effort to develop a unified strategy in what might be proposed to the Super Committee when it comes to spending cuts to programs within the jurisdiction of the House Ag Committee. Lucas says that the Committee will be attempting to decide what to recommend to the Super Committee, if anything, by mid October. Lucas says that if the Super Committee would decide to pick and choose programs and make the decision in their package to eliminate them, that would demand a response from the Committee- and it might mean that the House Ag Committee would have to expedite the writing of the 2012 Farm Bill in order to provide a different looking safety net if certain elements were eliminated by the dozen members of Congress that are a part of the Super Committee. For example, Lucas says that if the members decide they want to totally eliminate Direct Payments- that would throw off the balanced nature of the Safety Net as we currently know it- and would take away the only support available to some producers who need it in order to have the resources to keep farming. Lucas says that if the Super Committee cannot come up with a proposal that Congress and the President agree upon- sequestration would occur starting in January of 2012. These would be across the board cuts, but not all programs would be subject to those cuts. Lucas says the House Ag Committee staff is studying which program cuts will fall under sequestration- he mentioned that perhaps CRP payments would not while EQIP funding would see cuts under this concept. Lucas also talked about the timing of writing farm policy later this year or into 2012- and you can hear that and our full conversation by clicking on the LISTEN BAR below.